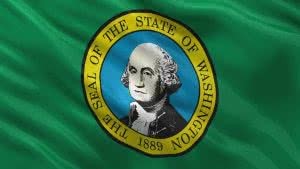 Washington is a state in the Pacific Northwest region of the United States located north of Oregon, west of Idaho and south of the Canadian province of British Columbia, on the coast of the Pacific Ocean. Washington was carved out of the western part of Washington Territory which had been ceded by Britain in 1846 by the Oregon Treaty as settlement of the Oregon Boundary Dispute. It was admitted to the Union as the 42nd state in 1889. Washington is the 18th most extensive and the 13th most populous of the 50 United States. Approximately 60 percent of Washington’s residents live in the Seattle metropolitan area, the center of transportation, business, and industry along the Puget Sound region of the Salish Sea, an inlet of the Pacific consisting of numerous islands, deep fjords, and bays carved out by glaciers. The remainder of the state consists of deep rainforests in the west, mountain ranges in the west, center, northeast and far southeast, and a semi-arid eastern basin given over to intensive agriculture. Washington is the second most populous state on the west coast and in the western United States after California.Washington’s major industries include manufacturing, technology, and tourism. Name of Washington corporation must be distinguishable from the name of any existing entity or forced fictitious names. Company Express will research your company name to make sure it meets Washington’s standards. Follow-up filings: Corporations must file an initial report within120 days after formation. Corporation’s principal office may be located outside of Washington, but local registered agent is required. Time to file: Washington requires corporations to file an annual report on or before the last day of the anniversary month of the company’s incorporation. The state fee is $69. Name of Washington Limited Liability Company must be distinguishable from the name of any other domestic LLC or of any foreign corporation authorized to do business in state. Company Express will research your company name to make sure it meets Washington’s standards. Follow-up filing: Required. The LLC’s initial report is due 120 days after formation. LLC’s principal office may be located outside of Washington, but local registered agent is required. Time to file: LLCs must file their annual report and and license renewal by the end of the month that marks the anniversary of formation. The state fee is $69.